"So, do you think you have an anger problem?" Lionsgate has revealed the first trailer for Tyler Perry's next drama, an infidelity thriller starring Taraji P. Henson called Acrimony. The word acrimony is actually a noun meaning "bitterness or ill feeling." It connects to the plot here, because Henson plays a woman tired of standing by her husband who continues to lie and cheat on her. Lyriq Bent plays her husband, with a cast including Danielle Nicolet, Jazmyn Simon, Tika Sumpter, Jason Vail, and Ptosha Storey. The film seems to be told through flashbacks, with Henson retelling her story of how she first met him and all the abuse she has quietly received over the years, before turning vicious and vengeful. This doesn't look so bad. A faithful wife (Oscar nominee Taraji P. Henson) tired of standing by her devious husband (Lyriq Bent) is enraged when it becomes clear she has been betrayed. Acrimony is the next film written and directed by the prolific, multi-talented filmmaker/actor Tyler Perry, director of Madea's Family Reunion, Why Did I Get Married?, Meet the Browns, The Family That Preys, Madea Goes to Jail, For Colored Girls, Madea's Big Happy Family, Good Deeds, Madea's Witness Protection, A Madea Christmas, The Single Moms Club, as well as Boo! A Madea Halloween (and its sequel out this year) previously. 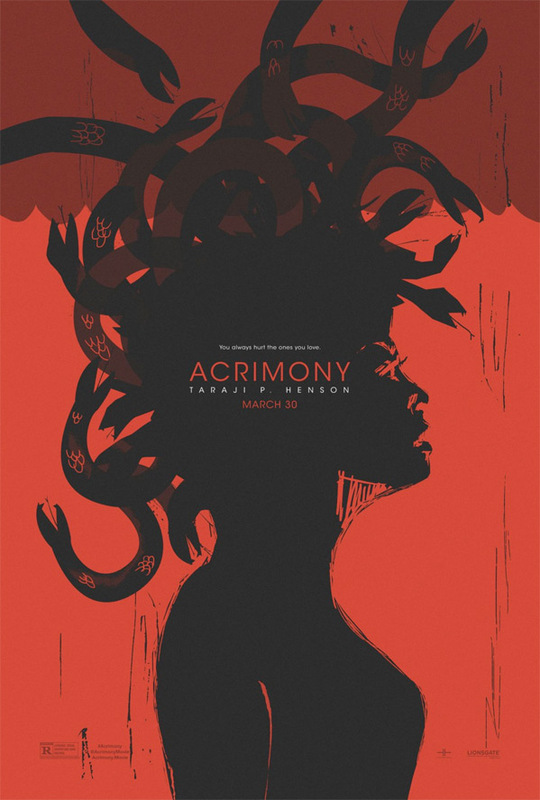 Lionsgate will release Perry's Acrimony in theaters everywhere starting March 30th, 2018 next year. Anyone interested in seeing this?